This beautiful old house dates in parts from the 17th century, and is certainly one of the most historic buildings in Oxford outside those of the university. In fact, its heritage goes back as far as the medieval period when the priest of an adjacent hospice is thought to have lived in a house to have previously stood on the site. However, perhaps its most notable historic connection in broad terms is to Oscar Wilde. 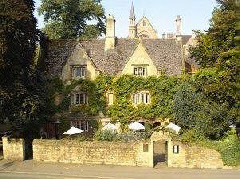 It is said that, having lost his rooms at Magdalen College for a minor misdemeanour, he found lodgings at the Old Parsonage. Quite how long he lived in the property is unknown, but it is thought that he stayed here for at least a few months in 1877. Today, the hotel offers 30 guest bedrooms, many of which boast original features. It also features a restaurant and bar, and is conveniently located for several colleges including Somerville, St Anne’s and Trinity. The city centre of Oxford is but a short walk away.